THE MAKING OF QUEEN ANNE NEVILLE. 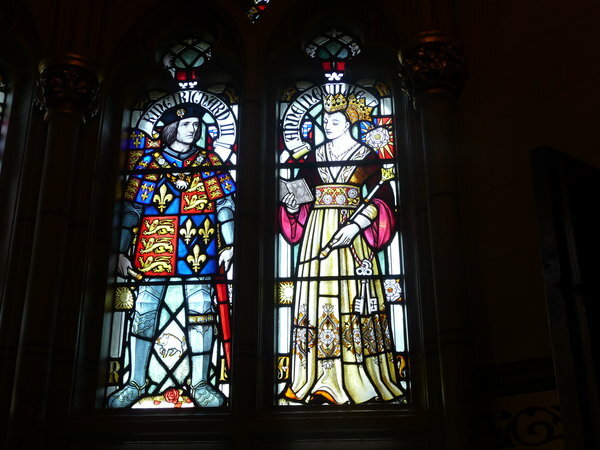 King Richard III and his wife Queen Anne Neville depicted in a stained glass window. 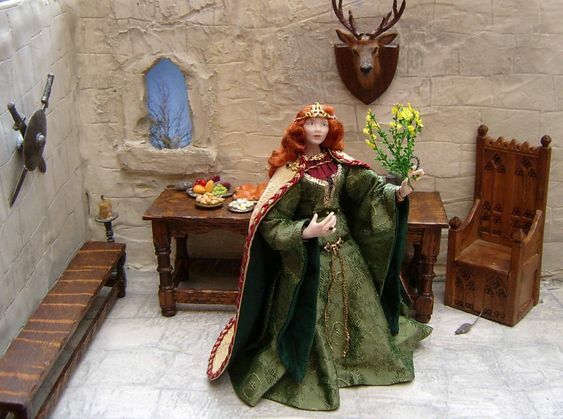 I found King Richard III’s wife Anne Neville, a really enjoyable character doll to create. It is rare that I get the chance to work on costumes from this particular historical era. 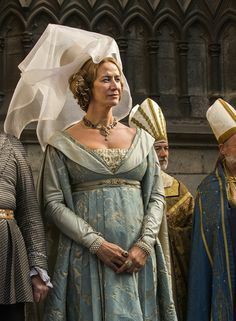 Late medieval female costume is so elegant, with long sweeping lines and very feminine. Once again the costume books were consulted for the most popular styles worn in the early to mid 1480s. To keep this doll as feminine as possible I decided to take the lighter shades from Richard’s colour scheme and use these for the main colours for Anne, accenting them with darker tones. 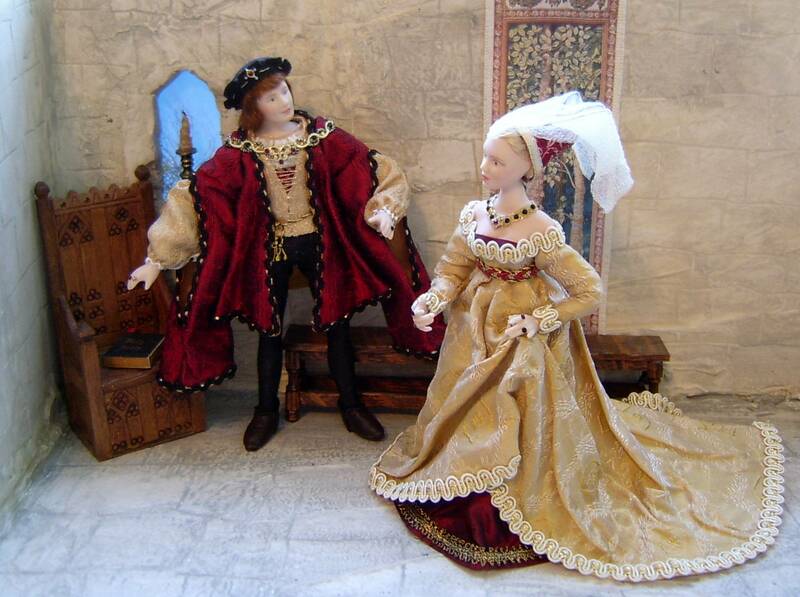 Richard’s doublet and the lining of his robe were pale gold so I used a similar coloured silk jacquard for Anne’s main gown and teamed it with another rich dark red silk for her under-gown. 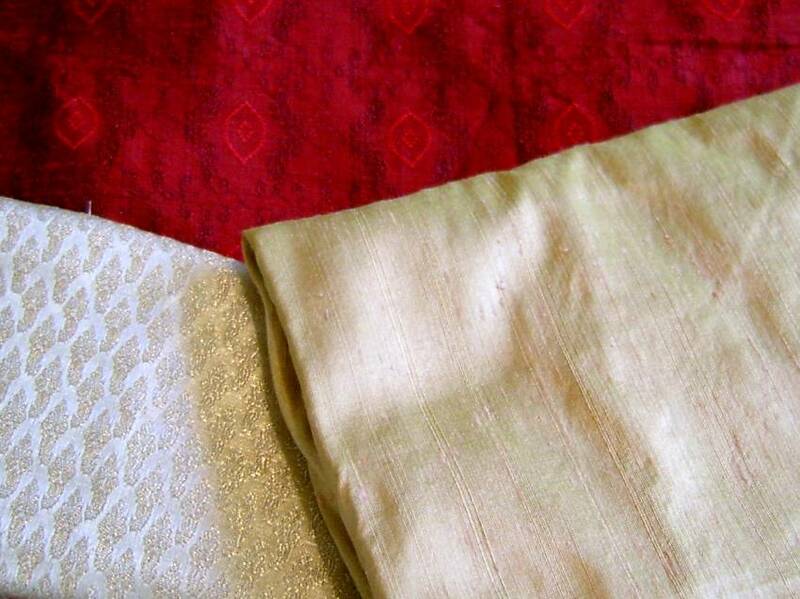 Silk fabrics chosen for Anne’s costume. 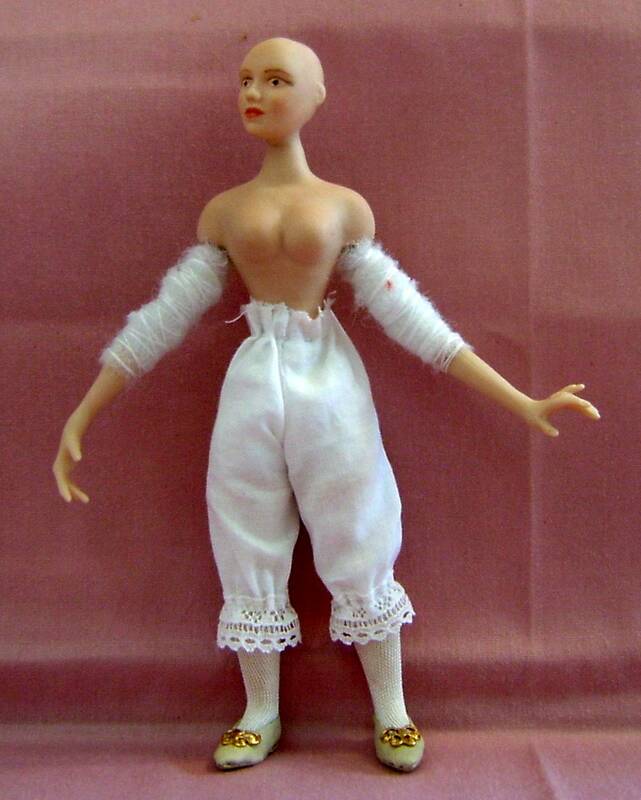 Firstly, I put some silk stockings on her… and then some pantaloons. Now before the historians amongst you start shouting at me, I know they were not invented then…….but I have my reasons for doing this. 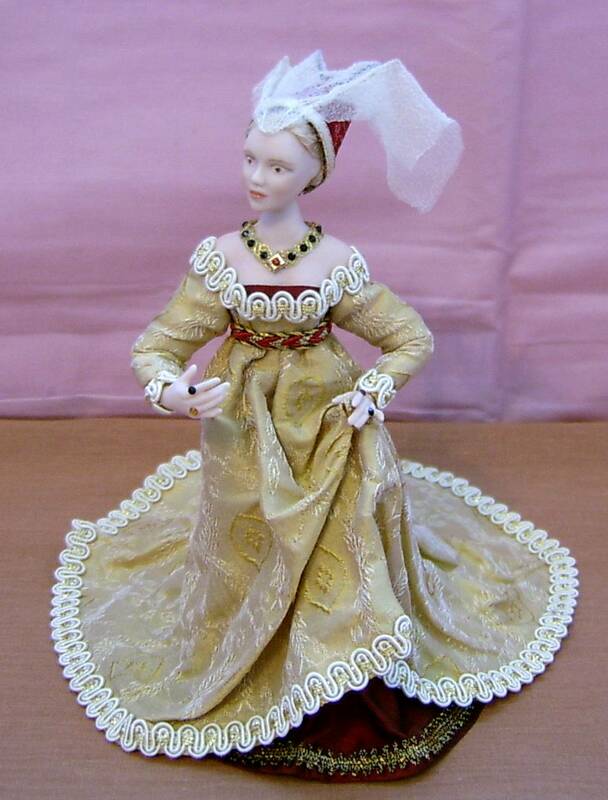 Although ladies of these times did not wear pantaloons, I always put them on my miniature lady dolls. The reason for this is very simple: Firstly, people ALWAYS turn dolls upside down to see what they are wearing underneath! 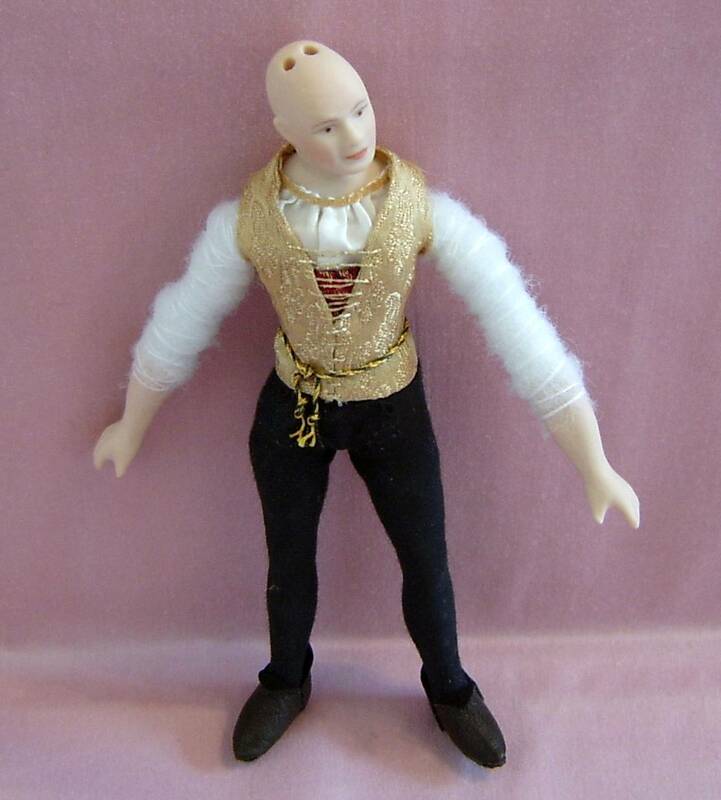 Secondly, most of my dolls are quite poseable and, with this kind of doll, there is usually a join where the lower porcelain part of the leg meets the upper wired and padded section of the leg and hips. 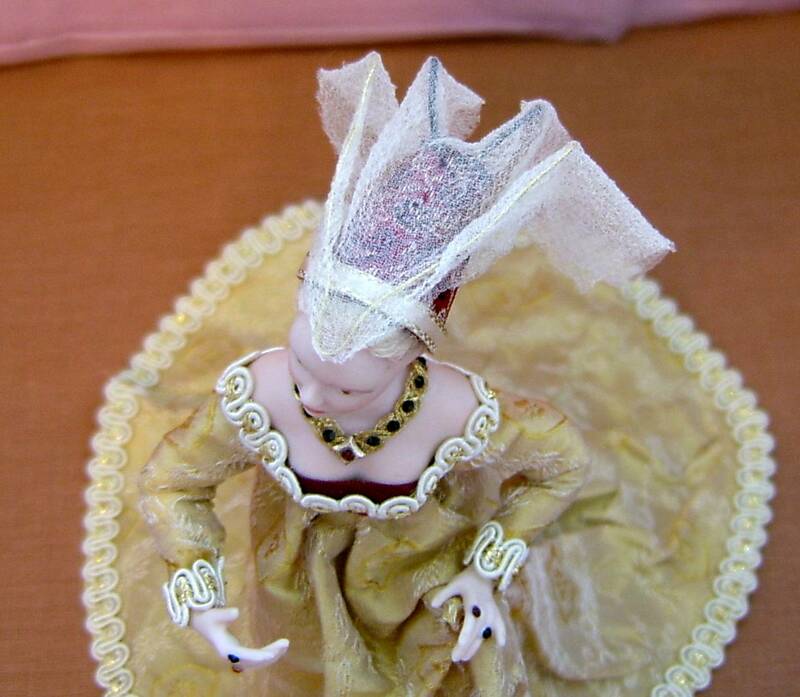 Pantaloons cover this join so that the doll looks nicer when she is inevitably turned upside down! Silk stockings and the (illegal) pantaloons. Leather shoes with slightly pointed toes were then added to complete her under garments. Anne’s leather slippers have slightly pointed toes and filigree decoration. The under-gown was then fitted in two parts, a tight close-fitting strapless bodice that represented the corset and the skirt which was often worn longer than the wearer for a woman of this class. To avoid bulk, I attached the skirt around the doll’s waist as I knew I would need to keep the area below her bust as smooth as possible to accommodate the skirt of the main gown. 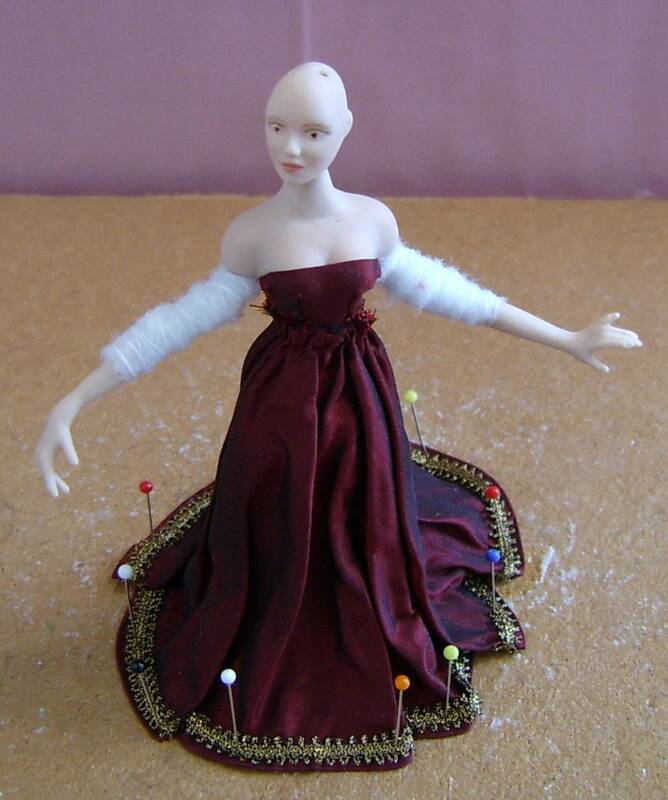 The doll was then placed on a cork board where her skirt was draped and pinned into folds. Anne’s silk underskirt is pinned to the board to set the folds. Over-gowns of this time were often voluminous with trains and skirts fell from just under the bust like an Empire line. Although V necked bodices had been popular, these did give way to a wide round necked version where the top of the corset could just be seen. 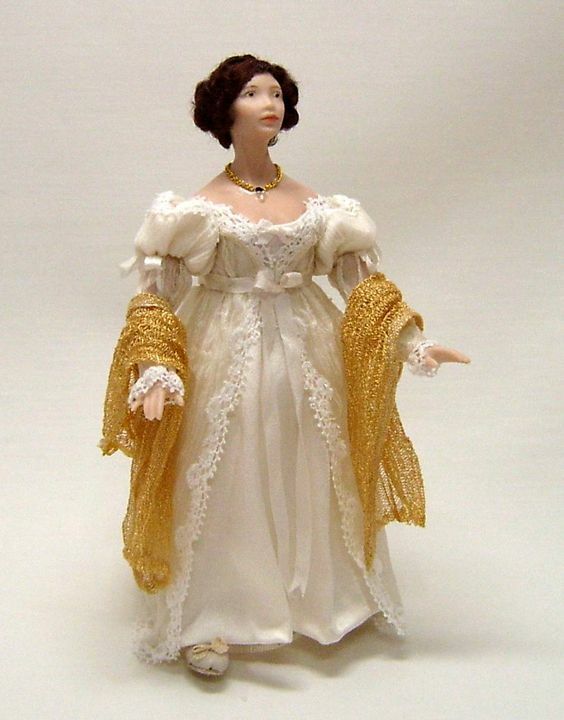 Sleeves could be narrow and fitted and I felt that this style would suit the doll best. All Anne’s top clothing is now in place. 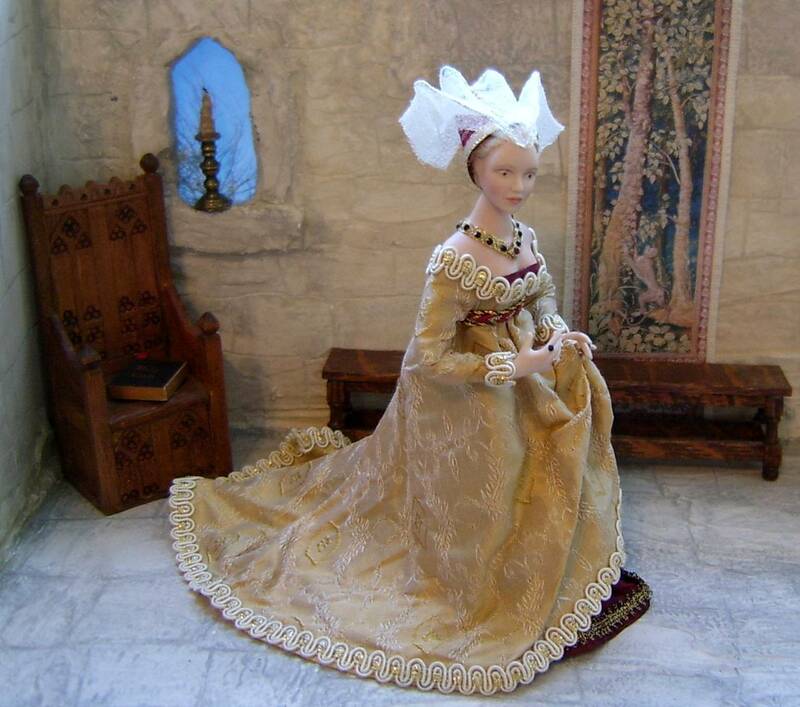 As far as fashion goes, in my opinion, the 15th century had some of the most ridiculous headdresses for women that history has ever seen. Size and shape became quite huge and outlandish and must have been quite a hazard for anyone standing too close! By the mid 1480s the ‘butterfly’ headdress had become the thing to be seen in for all fashionistas of this time. Basically it was an adaptation of the popular Burgundy headdress (like a tall fez) with the addition of wire frames to support a gauze veil. 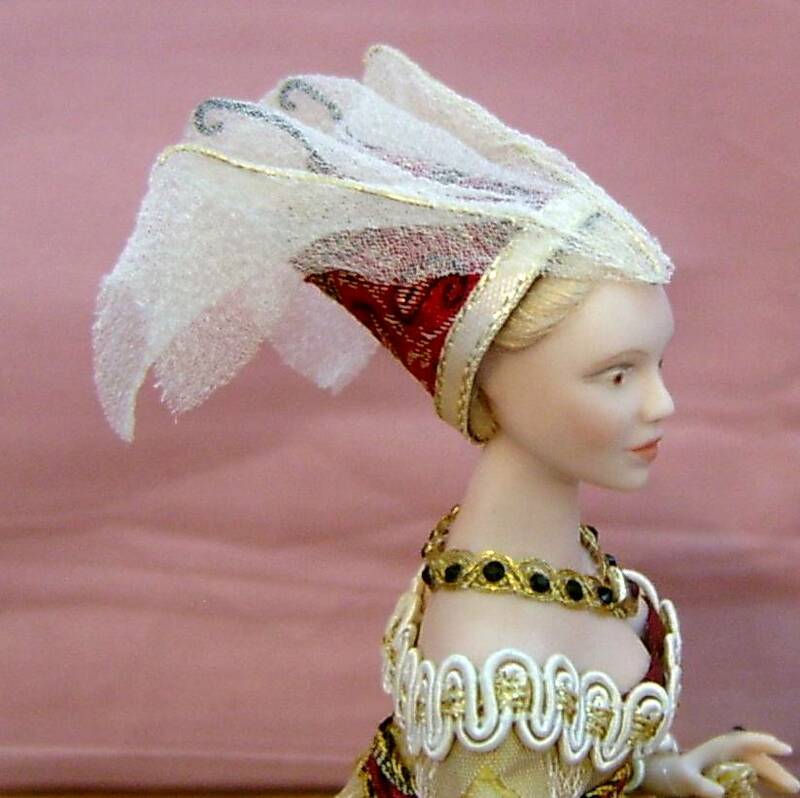 Here is a good example of the Butterfly headdress from the TV drama ‘The White Queen’. The fez part was worn quite far back on the head rather than on the top. Wires that looked like the antennae of a butterfly protruded from the back and another V shaped wire frame was attached at the front. The veil was then draped over the wires in a variety of different ways, depending on the wearer. At this time, it was still fashionable to pluck the front of the hairline to give the appearance of a high forehead, the rest of the hair being pulled back tightly and pinned up underneath the headdress, often in a linen under-cap. I had not made one of these ‘butterfly’ monstrosities before in miniature but was quite surprised that it wasn’t as difficult as I thought it would be. Close up of the wire supports and veil. Although fiddly, I was pleased with the final result. (Some of you may have noticed that I used the same fabric to cover the fez as I used for Richard’s stomacher). Showing the top of Anne’s Butterfly headdress. 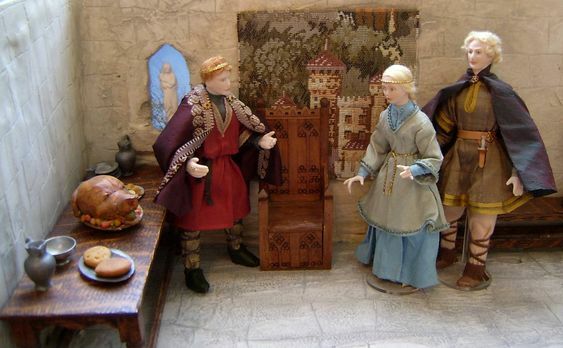 Anne Neville in medieval room box scene. 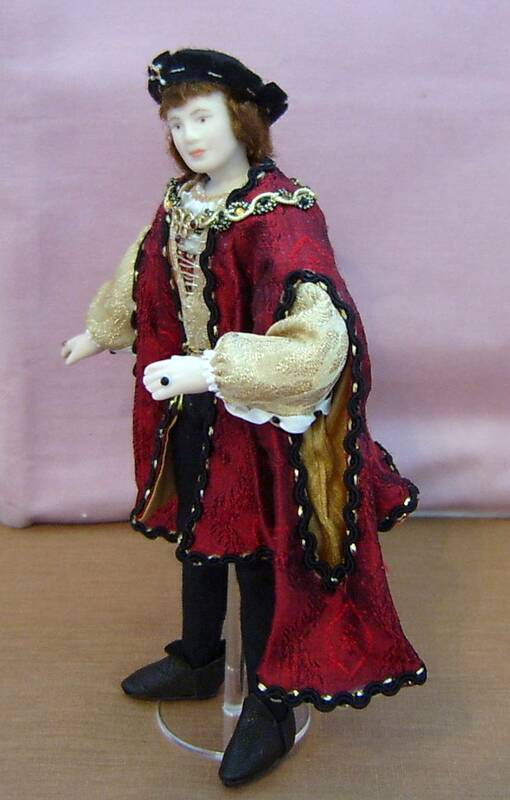 If you would like to read about my Richard III doll please scroll down to the post before. 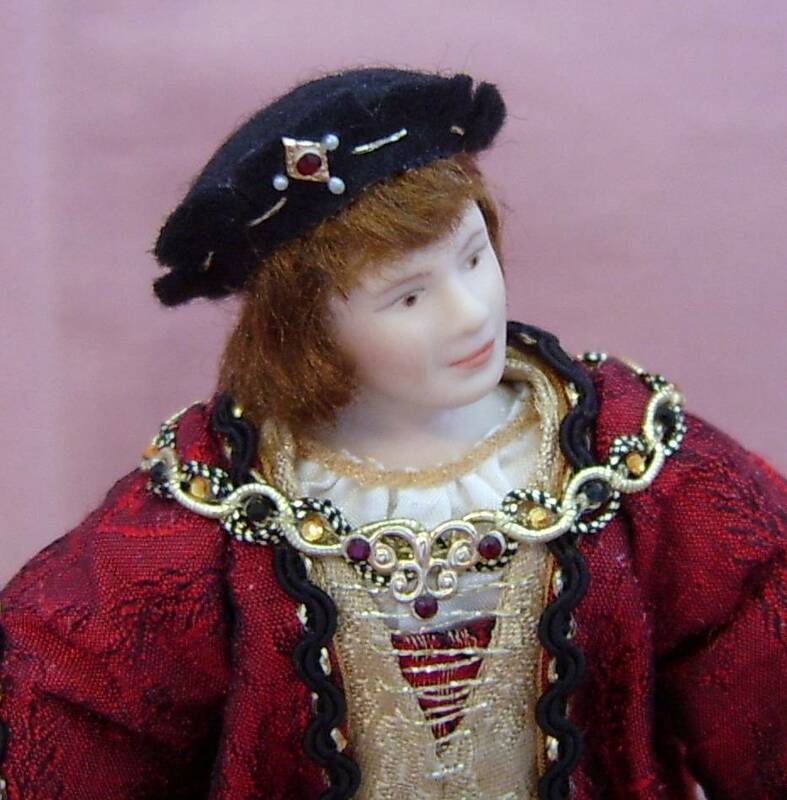 With all the publicity about the reburial of King Richard III at Leicester Cathedral this year, it was only a matter of time before I succumbed to the urge to make a miniature doll of this English monarch. I have always felt that this particular era was one of elegance regarding costume. It is the very end of the typical medieval fashions yet one can definitely see the beginnings of the more well-known Tudor styles. 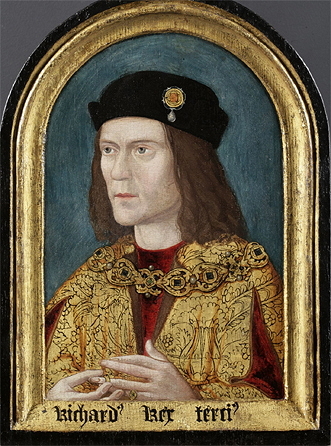 King Richard III died at the battle of Bosworth in 1485 so, with several historical costume books open at the mid 1480s, I made my decision regarding what exactly my Richard was going to wear. 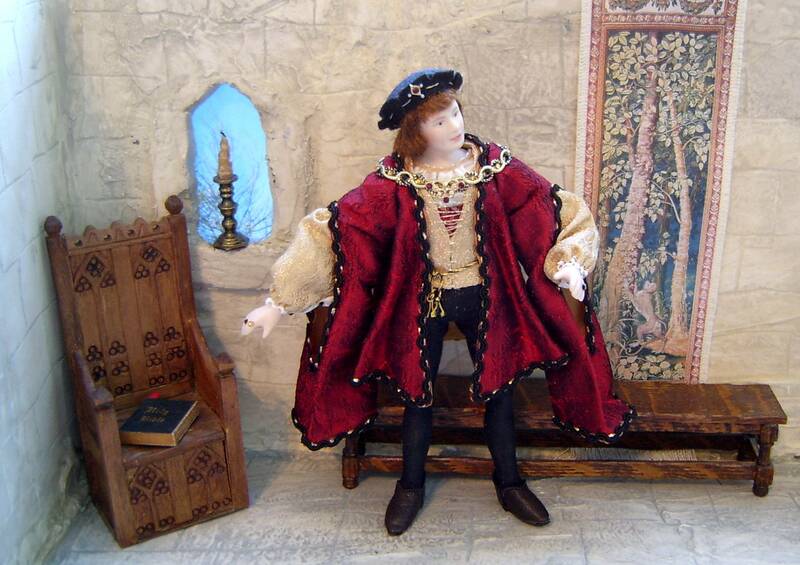 I had made a young King Henry VIII a few years ago, based on the fashions from the very early 1500s and it was quite noticeable that men’s fashions hadn’t really changed that much during those few years. Any changes that had taken place were very subtle so I was able to use the patterns I had made for young Henry to make those I needed for Richard. I wanted a complete change in colour scheme from Henry’s light, fresh palette so I decided to go with a richer, darker look, partly to reflect the darker mood of the times but without overpowering a miniature doll of only six inches tall. Eventually (it always takes me ages!) I settled on deep wine red and gold silks along with accents in black. 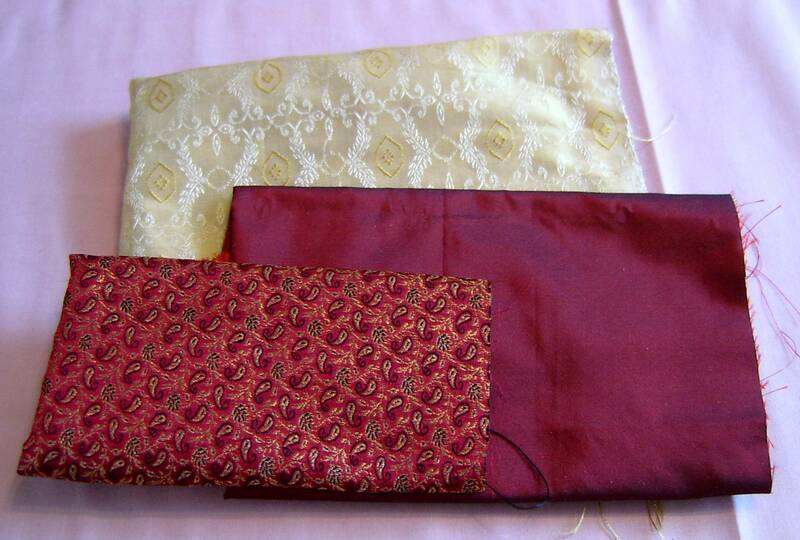 Silk fabrics chosen for Richard’s costume. First to be made were his black hosen (similar to tights). 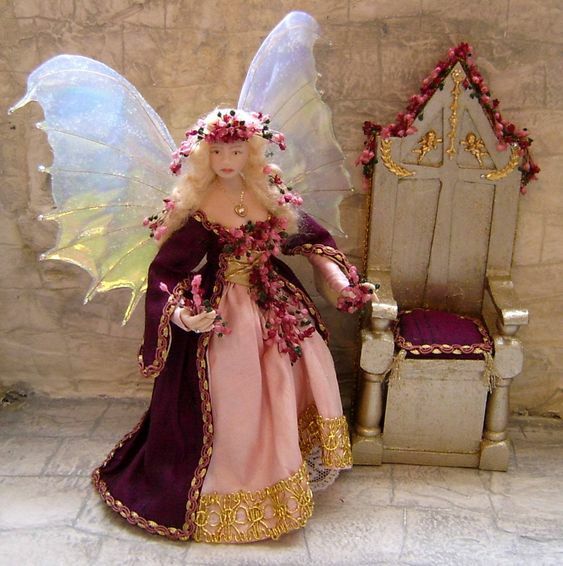 These are extremely difficult and time-consuming to do on a miniature doll but are worth the effort once finished. 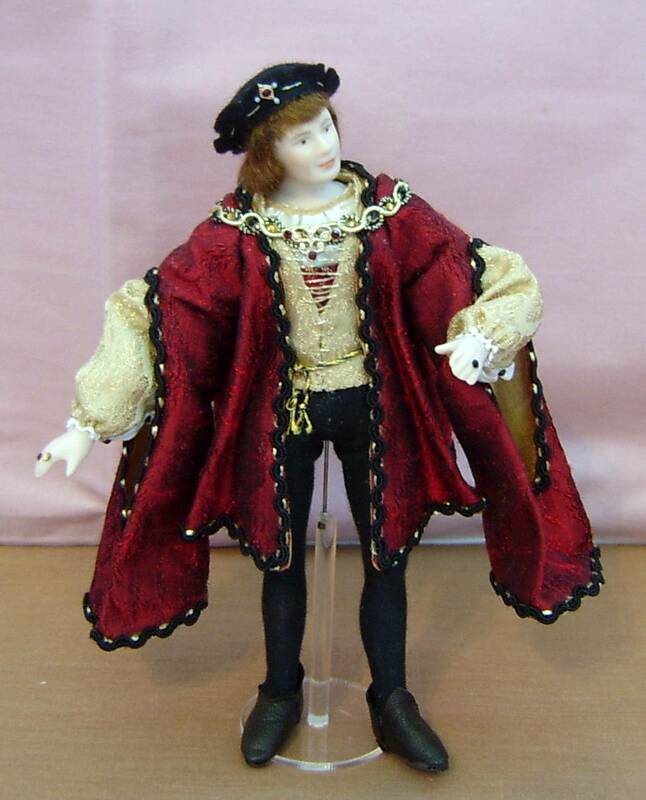 The cod piece is always a bit of a challenge, but having successfully mastered this with the young Henry doll, fore-warned was definitely fore-armed. The contents of the codpiece were in place and looking fine (and not ridiculous!) in just a few minutes…..unlike young Henry. (Click here if you would like to see what happened with Henry). Hosen with cod-piece, shoes ans shirt front. Richard’s footwear was quite different to Henry’s square-toed shoes, being more like an ankle boot than a true shoe. Although the fashion had been for very pointy-toed footwear, by 1485 the look was more rounded than it had been. There was also a flap or lip at the back and front of the ankle that could be worn turned up or turned down. 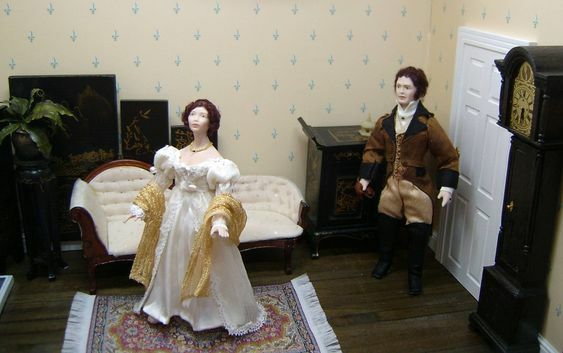 Shirts of this time were fairly low necked and as always with a miniature doll, my Richard’s shirt is simply a false panel of very fine silk secured in place to look like a shirt. The doublet of this time was short and not always worn with the skirted vest so I chose to show off my Richard’s legs by omitting the vest. This also helped reduce bulk in such a small doll. You may have noticed that behind the gold thread lacing on his doublet, there is a small panel of dark red and gold fabric. This is known as a stomacher and was a stiff section that was inserted into the centre front of a corset or other garment to help shape the top clothing and also aid good posture. 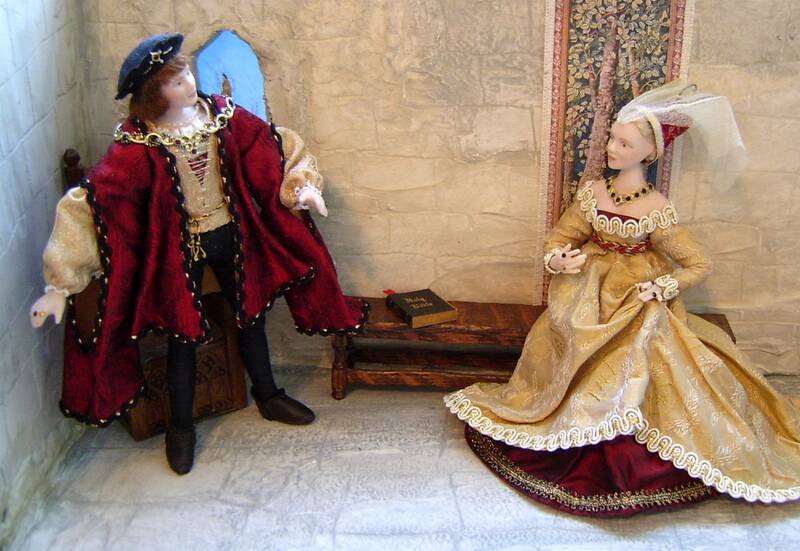 Most people have heard of this in female costume but it is not so well known that men also wore them at this time…… although they had disappeared in men’s costume by the mid 1500s……wonder why! (In female costume they lasted right into the 19th century). False doublet with gold thread lacing and cord tie belt. See the stomacher (panel) behind the doublet. Once Richard’s doublet was in place, the robe could be dressed onto him. At this time, the robe could be worn long or short. It had long lined sleeves that were slashed at the front to allow the lower part of the sleeve to hang down freely. 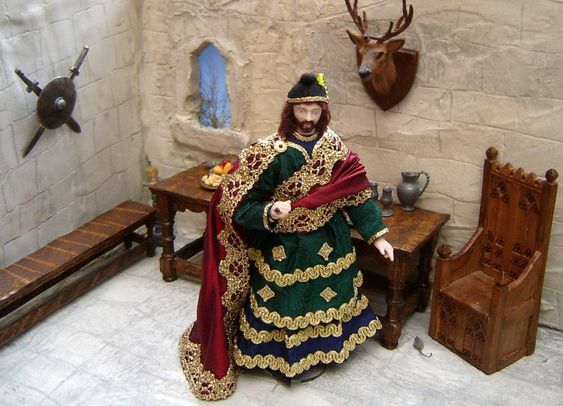 In a miniature doll, the main body of the robe is dressed onto the doll first, then the long robe sleeves are added. The last part was to add the doublet sleeves. 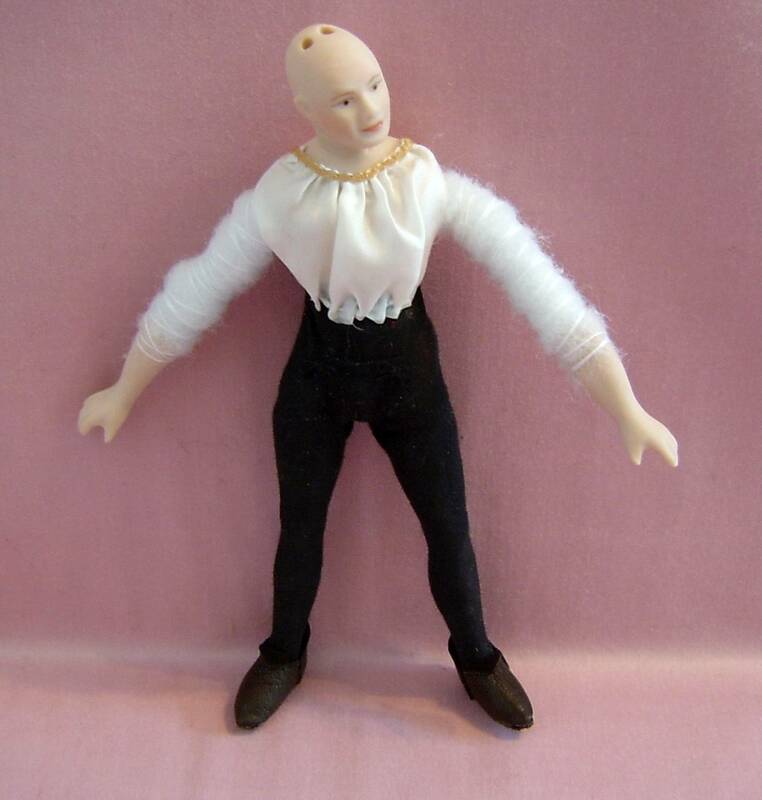 These were often slashed to reveal the shirt and with a miniature doll, false slashing is made using silk ribbon carefully hand stitched in place. Since Richard was a king, I decided to add a decorative heavily jewelled chain around his shoulders. This fashion lasted into the early 1600s for nobles and royalty. Richard’s robe is in place along with the false sleeves of his doublet. Here you can see the mock slashing on the doublet sleeves. The last part of my Richard’s costume was his hair and his hat. Much has been made about the possible colour of this king’s hair. I decided to stick with a darker colour, since in all probability (and we will never really know for certain anyway) his hair was more than likely fair as a child but darkened as he became an adult. Men’s hair at this time was often on the long side and worn in a page boy style with a hat that became known as a ‘pork pie’ hat. This was simply a close-fitting hat with a round turned up brim, often notched and decorated with lacing and a brooch. Richard’s hair is in place along with his hat. Next time, I will be talking about the making of Richard’s beloved wife, Anne Neville. 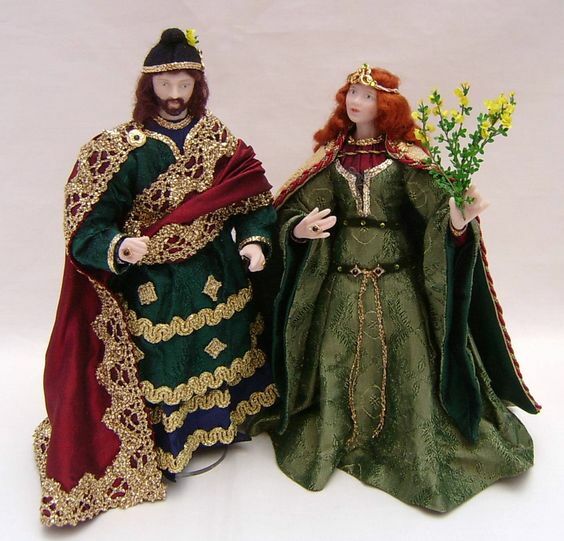 King Richard with his wife Queen Anne Neville.